“Three things that cannot be hidden for long in the North-East are the sun, the moon and the genocide,” commented a photojournalist documenting post-2009 structural and heritage genocide in the occupied traditional homeland of the Eezham Tamils. Not only the Sinhala military and the intruding extremist Buddhist clergy from the South but all the ministries and the departments of the unitary state system of Colombo are implementing their projects in the North-East without respecting the diversity and cultural sensitivities involved. Often, the underlying agenda of establishing the Sinhala Buddhist supremacy is visually exposed very quickly, the journalist said referring to the flag and plaque sites erected in the ‘Semata Sewana’ model villages being put by the ‘National Housing Development Authority’ (NDHA), which comes under the SL Ministry of Housing, Construction & ‘Culture Affairs’. ‘Semata Sewana’ is a Sinhala term, which means “shelter for all”. The Tamil equivalent “யாவருக்கும் வீடு” is not used. Instead, the Sinhala term is transcribed using Tamil characters as செமட்ட செவண. The Sinhala term “Gam Udawa” is also rendered in the same manner. “Besides, the Tamil place names of the ‘model villages’ are inscribed in broken Tamil. For example, சிவனொளி கிராமம் has been rendered as சிவனொலி கிராமம்,” the journalist further said with photographic evidence. 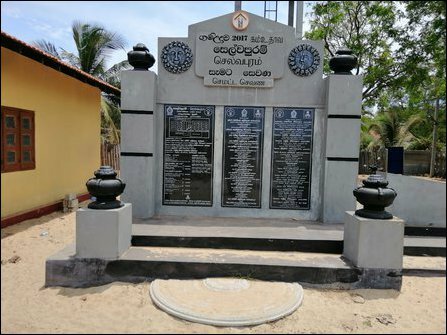 “The Tamil village names are featured in Sinhala script with prominence and the text in Tamil script is provided next to the Sinhala one with less significance. The message is clear: everything associated with Tamil must appear subsidiary in the Tamil homeland itself,” the journalist said. Furthermore, the Sinhala Theravada Buddhist iconography used in the plaque site accompanying the Sinhalacisation of the terms transforms the entire site into a Supremacist symbol in this context. 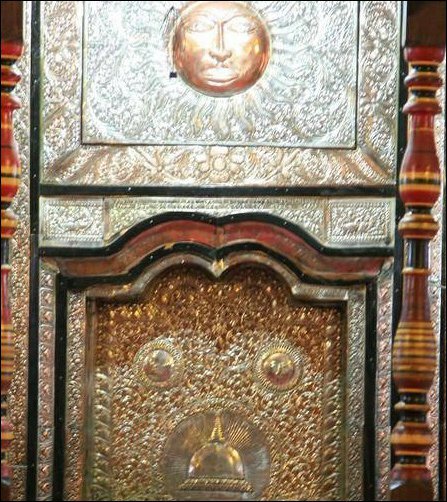 The rendering of the icons of the sun, the moon as used in the Kandyan gate of the Dalada Maligawa and that of the four vases surrounding the plaque, as well as the use of Sinhala Buddhist half-circle moon-stone (sandakada pahana) at the entrance of the plaque are Sinhala Buddhist, and exclusively so, in the eyes of Tamil-speaking people in the North and East. The identity of the photojournalist is protected in this news due to security reasons. Sajith Premadasa of the UNP leads the SL Ministry of Housing, Construction & 'Culture Affairs', who is aspiring to become the president of the unitary state in the future. Sajith is the son of the late SL President Ranasinghe Premadasa. The beneficiary families of the ‘Semata Sevana’ programme receive the title deed of the lands from the SL State. Necessary infrastructure is put up by the project funding coming through Colombo, and the houses are constructed in these land plots, adjacent to each other, using the loan granted to each family. “The pattern of Sinhala terms, Sinhala Buddhist iconography and the linguistic discrimination is the same with all the other SL ministries operating projects in the North-East as well. Everything points in one direction only, which is the same old mindset expressed in1956 through the Sinhala-Only Act,” the journalist observed. The SL Ministry of Agriculture was opposing the elected provincial council in the North to evolve a collective Tamil identity for the traditional food court in the province as ‘Ammaachchi’. It was insisting on using the Sinhala ‘Hela Bojun’. When the democratically elected NPC launched a heritage centre to “preserve and spread the knowledge on the ancient heritage of Tamil people,” the entire centre was dismantled from its content to name board, and the plaque by the Education Ministry of genocidal Sri Lanka through the previous SL Governor after the term of the NPC expired. The UN system, which should preserve the values of humanity, has no mechanism to ensure the cultural diversity which it pretends to maintain. Likewise, the agencies of the Colombo-based diplomatic community of the West, which indirectly coordinate many of the reconstruction and development activities in the North and East, are also not adhering even to the standards which they maintain in their countries with regards to multiculturalism and globalisation. “The Tamil diaspora actors are also taking part in their programmes which are not sensitive to the culture and heritage of the people in the North and East,” the photojournalist said. “Those among the Diaspora Tamils who opt to collaborate should at least have the courtesy of ensuring the minimum standards which the interlocutors of the diplomatic community must ensure to respect,” the photojournalist further said. 09.03.19 Manipulations at work to nullify NPC-evolved identity to Eez..
30.12.18 Heritage-genocide was motive behind scrapping of Tamil centr..